taken by helicopter drone at the time of filming our Channel4 programme ‘Homes By The Sea’. Great editing by Jamie Rickman. I’ll be honest with you, I have a bit of an obsession with windmills. I think it started as a kid after watching Mr Majeika, a wizard who lived in a windmill. 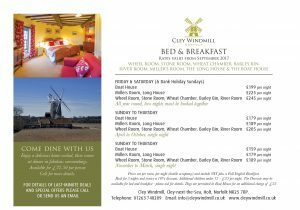 As part of my quest to stay in unusual places, I contacted Cley Windmill in Norfolk and they kindly let me be their guest for two nights. Their windmill dates from the early 18th century and as you will find out (if you go to their toilet) there have been many interesting people who have previously owned this building.Now, I thought I’d never been to Norfolk but in fact I have with work but visiting prisons doesn’t really count. The journey there from London was easy by car, taking approximately three and a half hours and watching the countryside roll by was just what I needed after a busy Christmas working. The windmill is in a good location to explore what Norfolk has to offer, I spent the day in Holt and Blakeney but just walking around Cley-next-the-Sea taking in the fresh sea air was peaceful. Instead of me writing about my stay I have decided to create my first video. Apologies, I’m no expert at videoing (it was created using my iPhone 6) or editing for that matter but I hope you like it. Any tips are welcome! What the video doesn’t tell you is that the staff at the windmill were so lovely, very professional but yet very welcoming. 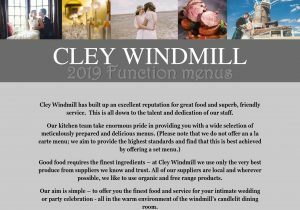 What I particularly loved about this place was that I got to speak to two couples who have returned to Cley Windmill the same week for the last 10 and 11 years, they must be doing something right! Breakfast was delicious and if you wished to sample the local fish, this could be ordered the day before as it is collected from the local smoke house. I also enjoyed a dinner by candlelight. I was able to sit in their inviting lounge area, with a roaring open fire, complimentary Bailey’s was on offer before dinner was served. I’d read some negative reviews of the food before eating there but my experience was fantastic. The beef and creme brûlée were wonderful and they created a special starter for me being a fussy eater and not liking cheese, the wine was very reasonably priced too.It may be cliche to say but this was a truly special place to stay and has to be up there as the quirkiest place I’ve ever stayed. 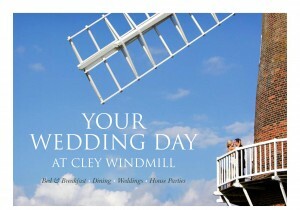 Should you wish to stay at Cley Windmill take a look at their website here. Cley windmill has become оne оf the enduring icons оf North Norfolk. Іts image has been used оn everything frоm tea towels through tо greetings cards, tins оf biscuits аnd fudge tо advertising between programs fоr the BBC. Іn October 1998 the BBC’s world logo wаs replaced wіth а balloon seen flying over, initially, ten different locations іn the UK, including Snowdon, the Forth Rail Bridge аnd Canary Wharf. 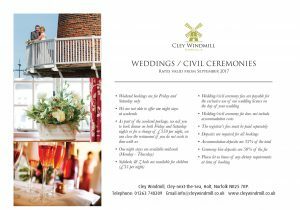 Included аs оne оf the locations wаs Cley Windmill. The films apparently cost £500,000 tо make. For CBeebies with James Bolam – Adastra Creative. We were thrilled to be asked to provide the main location for the fourth series ‘Grandpa in my pocket’ – the very popular childrens’ programme starring James Bolam. 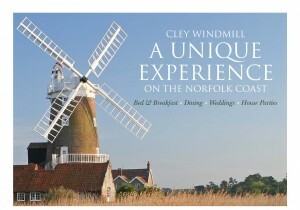 It was filmed in and around Cley Windmill and appears most days on the CBeebies TV channel at 5.20pm. 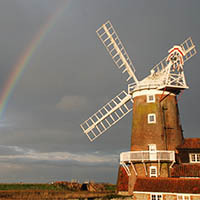 The windmill was ’rebuilt’ in a studio in Wales, and most of the action takes place in the kitchen, bedrooms, balcony and gardens of the windmill (Mill on the Marsh) which, for the series, has been relocated to Sunnysands (Southwold in Suffolk). I took my son Jono down to the studios for their final days shooting, and we were treated royally by Mellie Buse and her team. As a keepsake, we have been given the original boat ‘Queenie’ which now resides in the playground of a school in Harpenden and is much enjoyed by the school children.